The Temple of Harmony, photographed in January 2016. 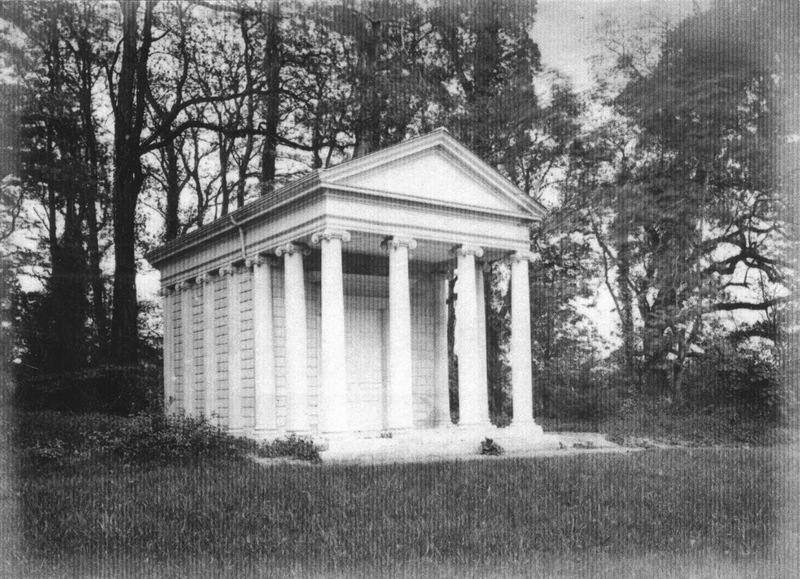 The Temple of Harmony, photographed c.1898. 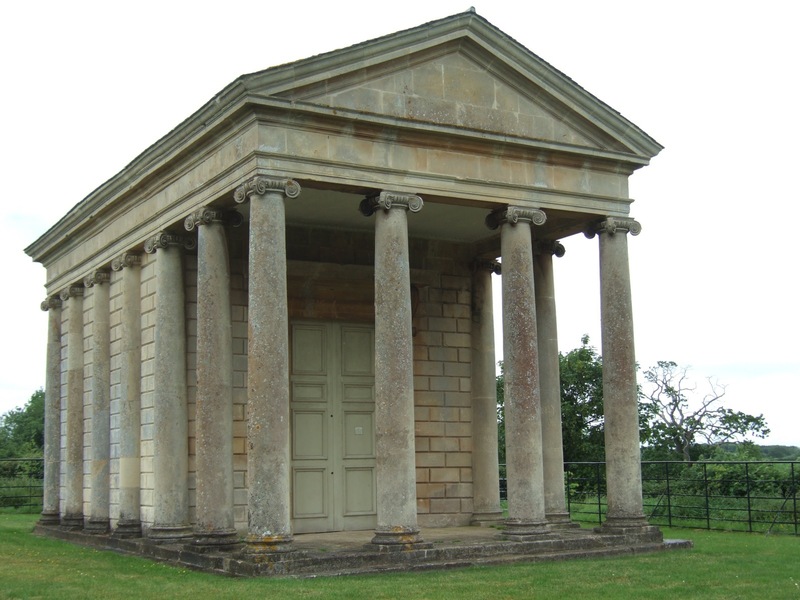 The Temple of Harmony, designed by Sir Charles Kemeys-Tynte’s gentleman-architect friend Thomas Prowse (1708-1767) was based on the plans in Isaac Ware’s (1704-1766) influential The Four Books of Andrea Palladio’s Architecture published in 1738. Palladio’s designs were taken directly from the ancient Temple of Portunus which still stands in Rome. 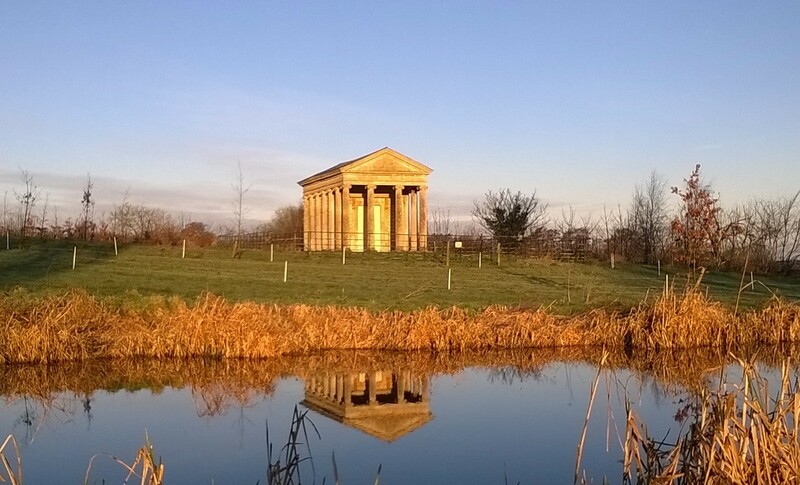 Halswell’s Temple of Harmony, though inspired by Palladio’s vision of ancient Rome, was designed and built by gentlemen architects, like so many of the monuments throughout eighteenth-century Britain. The Estate Steward for Halswell, Mr Escott, records in his eighteenth-century memorandum that the building was commissioned in 1764 at a cost of £400 and was dedicated to the memory of two of Sir Charles’ friends: Mr Peregrine Palmer of Fairfield House, Somerset, MP for the University of Oxford, who died in 1762, and Mr Thomas Prowse, the Temple’s architect, an MP for Somerset who died in 1767, the year the building was completed. Transcription of the Halswell Steward’s diary, Escott’s Memorandum, relating to the commissioning of the Temple in 1764. Thomas Prowse MP (1707-1767) as a gentleman-architect did not fully seek gainful employment in architecture but instead often helped his friends by advising them on Palladianism and guiding their taste and that of their architects or draughtsmen. Therefore the amount of his influence in certain projects is difficult to gauge, however his name is linked to some of the most important Palladian country houses in the region. The monumental Hagley Hall, one of the last great houses in this style is associated with his name, as are his designs for Hatch Court in nearby Hatch Beauchamp, built c.1755. He also advised on the designs of the Palladian Copped Hall in Epping Forest, but also farther flung houses such as Kimberly Hall in Norfolk and his own estate Wicken Park in Northampton, which he inherited in 1750. 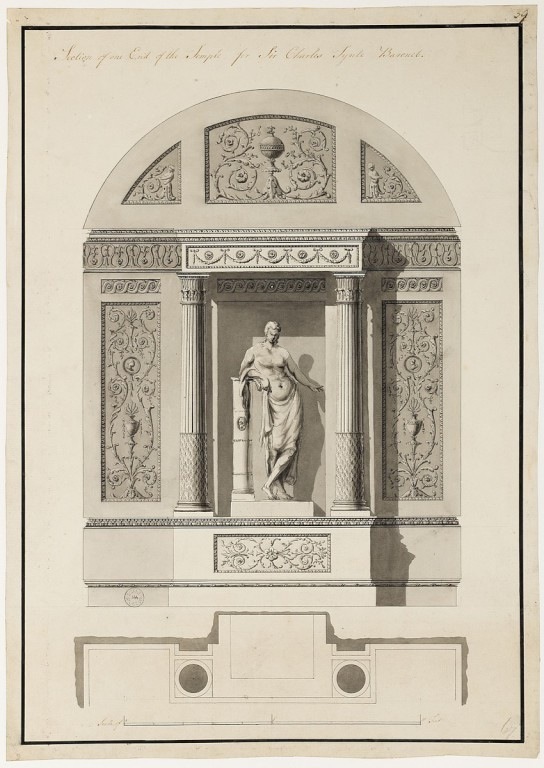 As a strong propounder of the fashionable Palladian style he would have been deeply influenced by Isaac Ware’s English translation of Andrea Palladio’s (1508-1580) Four Books of Architecture, where drawings which were to become the basis of his work at Halswell were printed. Prowse’s views on the muscularly English Baroque wing of Halswell House are not known, but the antipathy between the freedom of the English Baroque as typified by architects such as Inigo Jones (1573-1652) and Sir John Vanburgh (1664-1726) and the ‘rules’ of the more elegant Palladianism was a publicly fought national battle of taste. We are perhaps lucky that no ‘improvements’ were carried out to the Baroque wing of Halswell under the guidance of such a strong friend of Sir Charles and Palladianism. Engraving of the Temple of Portunus in Rome, from Isaac Ware’s English edition (1738) of I quattro libri dell’architettura by Palladio. 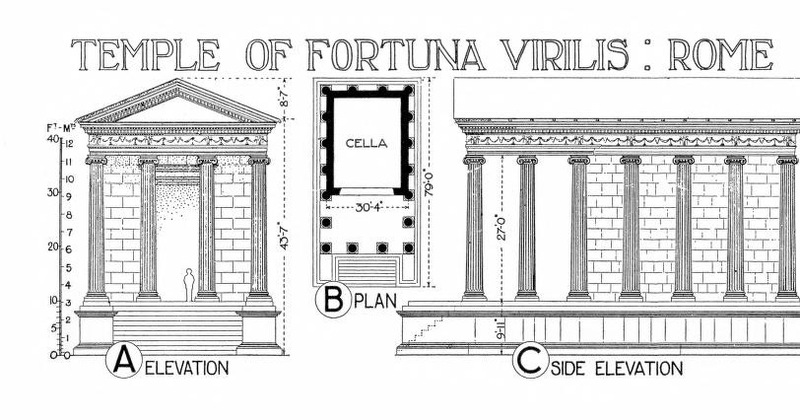 1921 Plans of the Temple of Fortuna Virilis (now correctly identified as Portunus), Rome. The original Temple of Portunus itself is an ancient monument in Rome, the main temple dedicated to the god Portunus in the city. It is in the Ionic order and is still more familiar by its erroneous designation, the Temple of Fortuna Virilis (“manly fortune”) given it by antiquaries. Located in the ancient Forum Boarium by the Tiber, during Antiquity the site overlooked the Port Tiberinus at a sharp bend in the river; from here, Portunus watched over cattle-barges as they entered the city from Ostia. Built between 120- 80 BC, the rectangular building consists of a tetrastyle portico and cella, raised on a high podium reached by a flight of steps, which it retains. Like the Maison Carrée in Nîmes, it has a pronaos portico of four Ionic columns across and two columns deep. The columns of the portico are free-standing, while the remaining five columns on the long sides and the four columns at the rear are engaged along the walls of the cella. This form is sometimes called pseudoperipteral, as distinct from a true peripteral temple like the Parthenon entirely surrounded by free-standing columns. It is built of tuff and travertine with a stucco surface. The temple owes its state of preservation from its being converted to use as a church in 872 and rededicated to Santa Maria Egyziaca (Saint Mary of Egypt). 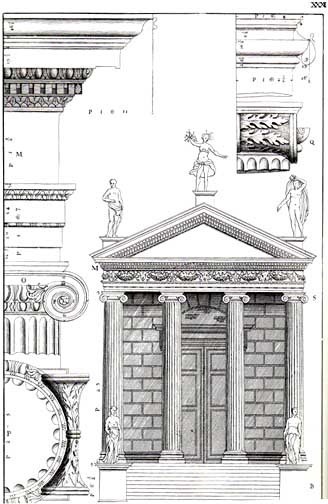 Its Ionic order has been much admired, drawn and engraved and copied since the 16th century. The circular Temple of Hercules Victor is located south-east to the temple in the Forum Boarium. 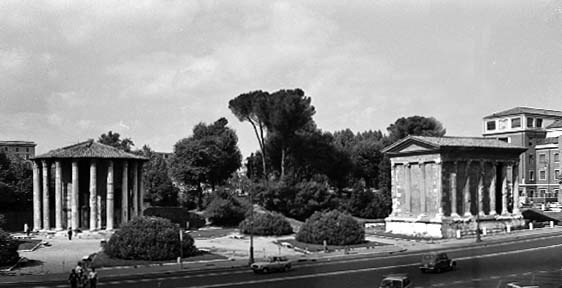 Temple of Hercules Victor, Rome, later 2nd century BC, (left) and the Temple of Portunus, 120-80 BC, (right) in the Forum Boarium, recalling the relationship between Halswell’s Rotunda and Temple of Harmony. 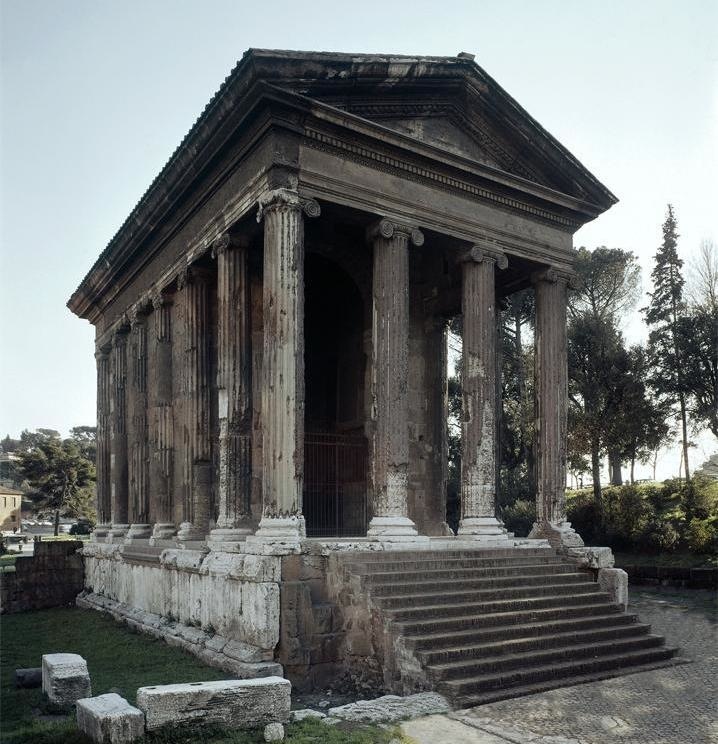 The Temple of Portunus, Rome, 120-80 BC. The Rotunda at Haslwell, built 1755. 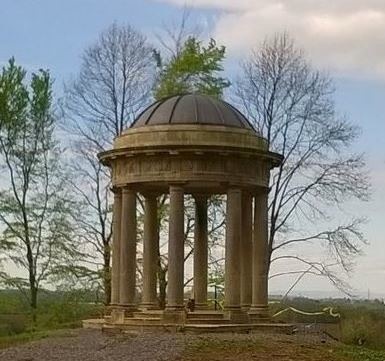 The Temple of Harmony, built 1764-7 with a direct view between it and the Rotunda. Inside the Temple things were done a little differently. Robert Adam (1728-1792) was probably the most renowned neoclassical architect and designer of ancient interiors. With the wall paintings at Pompeii and elsewhere being discovered for the first time there was renewed interest in the interiors of the ancients, so who better to bring the Temple’s interior to life than Robert Adam himself. 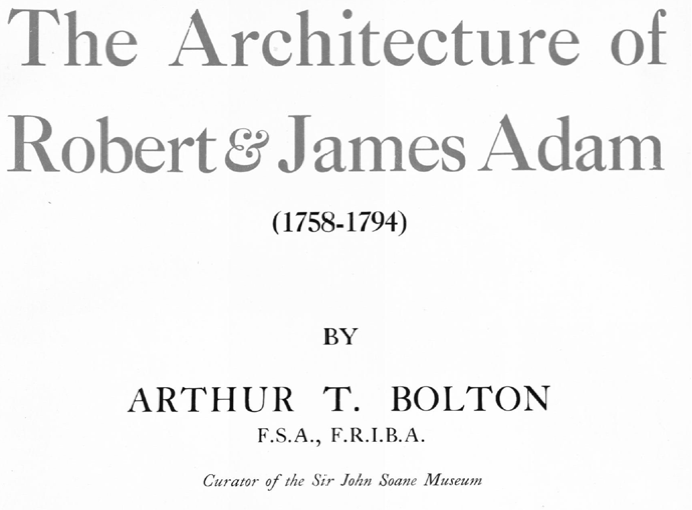 His commission and the designs he made for the Temple are recorded by Arthur T. Bolton of the Sir John Soane Musuem and the original designs are held there. Extract detailing the original commission details of the Adam designs. Robert Adam’s design as built, abandoned and left ruinous, then saved by the Somerset Building Preservation Trust. 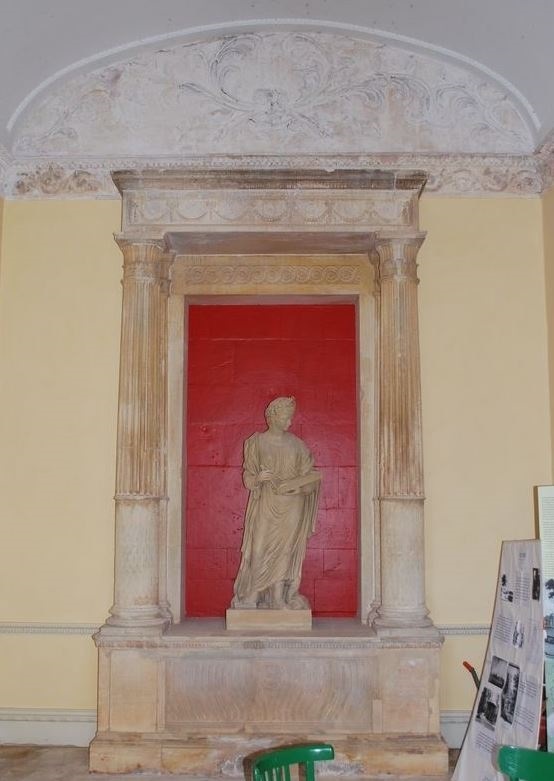 The statue of Terpsichore is a replica of the original which left the estate in 1950 and was purchased by the Museum of Somerset, with aid from the Art Fund, in 1994. 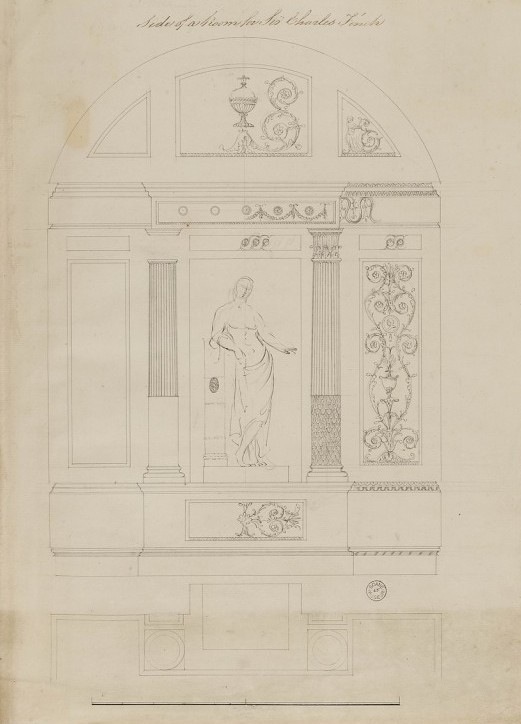 In a letter dated 1767 from Sir Charles to Mr Escott, Sir Charles includes a sketch by his own hand of the niche which was newly commissioned from Robert Adam for the west wall inside the temple. 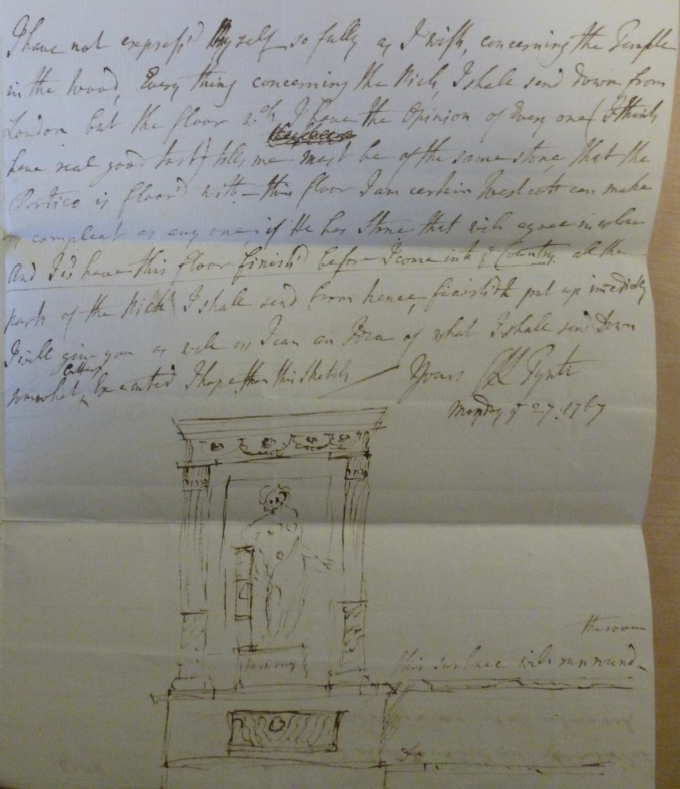 Sir Charles has inscribed the plinth beneath the statue ‘HARMONY’, however figure is of a partly draped woman leaning on a column, as Robert Adam had drawn in his second and final versions on his own designs, though his seem to be of a male. This was not carried out in this way, nor was the floral relief carving beneath, Sir Charles’ sketch is closer to the actual carving which has a wavey reeded motif. Letter from Sir Charles Kemeys-Tynte to Mr Escott, 1767. 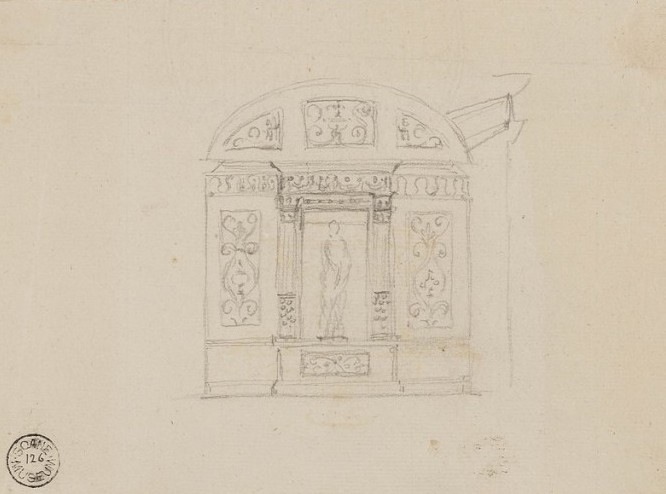 The three panel section in the barrel vault above the niche, as drawn by Adam, was never completed. It seems that the actual dimensions of the vault were misunderstood by Adam when he returned from his first drawing, where the drawing is closer to the real building, to his more to his more worked-up second drawing where the arch takes on a more standard barrel vault shape. The designs returned by Adam would not fit the actual space, and it is presumably for this reason that this area of plasterwork was changed in the execution. The Temple’s name is a very interesting comment on the nature of Mill Wood as a whole, taking as it does musical harmony as its theme. 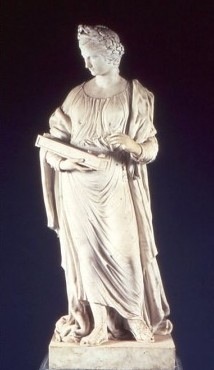 Terpsichore was one of the nine Greek muses of the arts. One of the mothers of the Sirens, she was the muse of dance and chorus, her name, Τερψιχόρη, being a literal translation of “delight in dancing”. By naming the last structure built in Mill Wood after a musical muse and erecting a standing statue of her holding an Aeolian harp Sir Charles’ has put the music of the pagan ancients prominently in his pleasure grounds. Though Terpsichore is commonly depicted seated and playing a lyre, this commission has been very specifically executed so that the idea of harmony is paramount. Besides being the only stringed instrument played solely by the wind, the Aeolian Harp, named after Aeolus the ancient Greek god of the wind, is the only stringed instrument that plays solely harmonic frequencies. The motion of the wind across a string causes periodic vortices downstream, and this alternating vortex causes the string to vibrate. Lord Rayleigh first solved the mystery of the Aeolian harp in a paper published in the Philosophy Magazine. This harp had a strong influence with some of the romantic poets and painters of the late-eighteenth and early-nineteenth centuries: examples include Coleridge’s The Eolian Harp of 1795, Shelly’s Ode to the West Wind of 1820 and JWM Turner’s Thomson’s Aeolian Harp, painted in 1809. The plinth below the statue of Terpsichore in the Temple of Harmony. Is this unusual decoration of wave-like grooves flowing around a central circular motif representative of wind around a string? Abandoning Robert Adams’ own plinth design for this unusual feature would surely have been done for some good reason. With the reverberating sounds of the water cascades, the rustling of trees and the sound of birdsong that would have lent Mill Wood a very particular aural character it is interesting to wonder if there was ever an Aeolien Harp installed at the Temple of Harmony, adding its own voice to the sounds of Mill Wood. 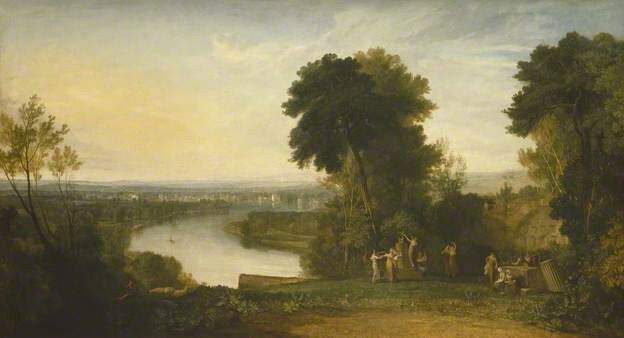 Joseph Mallord William Turner’s (1775-1851) “Thomson’s Aeolian Harp” of 1809 at Manchester City Galleries. The Muses dance and sing around an Aeolian Harp on a plinth as it plays music by wind power.